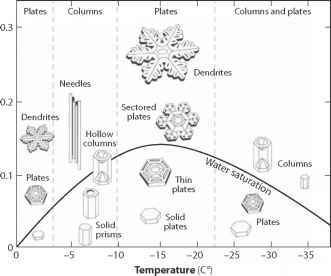 In the winter months, the cooling influence of snow-covered surfaces helps to promote the creation of dense, high-pressure ("continental polar") air masses, which penetrate to midlatitudes as cold fronts. Strong winds and snowfall are followed by cold, clear weather and temperature inversions as continental polar air masses set up over a region. These air masses form over sea ice and over high-l atitude (i.e. snow-covered) land masses during the winter months due to longwave radiative cooling, low amounts of incoming solar radiation, and the cold surface area. In the Northern Hemisphere, cold fronts are associated with upper-air troughs and southward displacement of the polar front over the continents, driving Rossby wave structure and meridional mixing (baroclinic instabilities). The thermal contrast between snow-covered land and open ocean in the midlatitudes of the Northern Hemisphere promotes strong temperature gradients that help to drive this mixing. This results in a mobile polar front and alternation between cold, dry (boreal) and mild, wet (southerly or westerly) air masses in the winter months in much of North America, Europe, and Asia. Similar air-mass cooling occurs year-round over Antarctica, driving the ferocious katabatic winds that descend from the continent. Unlike the Northern Hemisphere, however, high latitudes in the Southern Hemisphere have a relatively simple land-sea configuration, so circulation in the ocean and atmosphere is strongly zonal. The deep cooling influence of the high-elevation, perennially snow-covered continent helps to strengthen the Antarctic vortex, further isolating the continent from warm, midlatitude air masses. surface of a melting glacier cools the air in the glacier boundary layer. This cooling influence extends to both the glacier surface and the adjacent, downwind region. Large ice sheets like those in Greenland and Antarctica also influence climate by presenting a topographic obstruction to tropospheric circulation. Similar to mountain belts, air flows around these obstacles, and much of the time they create persistent high-pressure (anti-cyclonic) circulation patterns. During the Pleistocene glaciations, ice sheets over North America and Eurasia disrupted the midlatitude westerlies and the prevailing pattern of stationary waves, leading to splitting of the polar jet stream over North America and increases in precipitation south of the ice sheets. Expanded sea-ice cover over the North Pacific and North Atlantic during the glaciation also modified the stationary wave pattern and the associated storm tracks, through southern displacement of the Aleutian and Icelandic Lows. Because snow and ice affect pressure patterns, inter-annual variability in seasonal snow and ice may also play a role in patterns of variability in high-latitude atmospheric circulation, such as the North Atlantic oscillation and the Arctic oscillation. This is not fully understood.